If you’ve been waiting to buy a new home thinking that prices will continue to fall as builders get more desperate to sell homes, I think you may have missed the boat, er, house. The bruised new home market continues to show signs that the worst is over including numbers just released showing new home sales in the U.S. in August were up almost 28 percent from a year ago and new home prices were up 17 percent during the same period in the U.S. 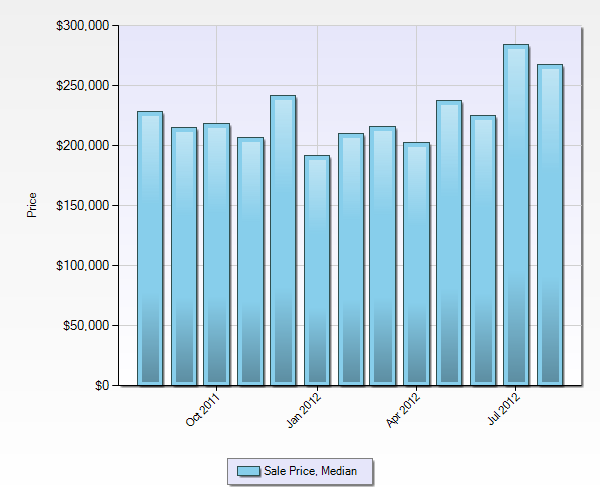 Here in St. Louis, the St. Louis HBA just reported that building permits for new homes in St. Louis are 15% through August compared with this time last year and St Louis new home prices, as you can see from the chart below, while down slightly August from July, are up significantly in the past year from a media price of $228,000 in August 2011 to a median price of $268,000 in August 2012. Be sure to click “more” to see the chart.. Source: MARIS - Note, this chart is based upon homes sold during the period, as reported to the MLS with an age of "0" which, while it will include new construction, could include older homes as well that did not indicate an age.